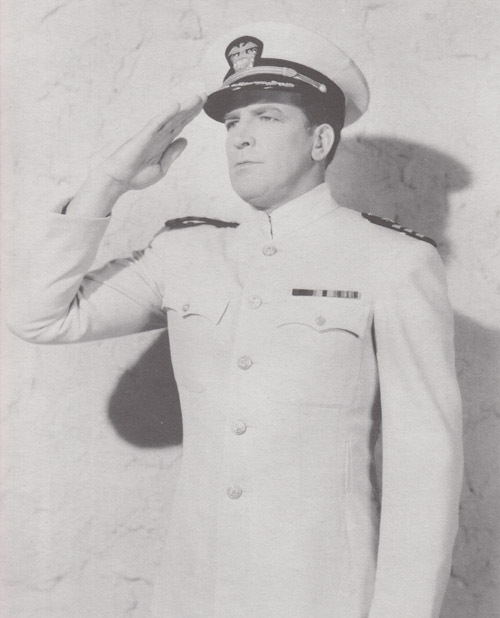 Above: A publicity still of Don Terry as serial hero Don Winslow of the Navy (Universal, 1941). Tall, rugged-looking, and raspy-voiced, Don Terry was one of the serial genre’s more forceful and commanding leading men–but was also capable of conveying a hearty geniality that prevented his characters from ever seeming excessively stern or gruff. His combined authoritativeness and affability made him an ideal choice for the best-known role of his short screen career–US Navy Commander Don Winslow, the good-natured but militarily stalwart protagonist of a pair of Universal serials. Don Terry was born Donald Prescott Loker in Natick, Massachusetts. At the age of sixteen he joined the Marines in hopes of getting in on the first World War, but was injured while training at Paris Island and discharged; he subsequently attended Harvard before transferring to Norwich University. Capitalizing on college athletic experience, he spent a season with the Providence Steamrollers football team after graduating Norwich, and subsequently boxed professionally before setting out to travel the world in 1926; he worked his way from America to England and then across the European continent to Egypt; his jobs during this period included service on a cattle boat, in the French offices of the American Express Company, and in the Riviera vineyards. After returning to America, he ventured out to Hollywood, and in 1928 was “discovered” by then-popular author and screenwriter Charles Francis Coe, who recruited him for the leading role in Me, Gangster, an Fox film based on one of Coe’s stories. Fox changed Loker’s name to Don Terry, and cast him in starring or prominent supporting roles in several other films (Blindfold, Fugitives) over the next few years; however, the studio seems to have dropped him around 1930, possibly because of concerns about the unsuitability of his rough-sounding voice to the new talkie era. The early years of the 1930s found Terry playing bits in films for big studios like Universal and RKO, as well as occasional leading roles in B-pictures for low-budget outfits like Tiffany. He appears to have left the picture business altogether in 1933, not resurfacing in Hollywood until 1937; his activities during this hiatus are unknown to me, but it seems equally possible that he might have worked on the stage or gone back to the sports arena. Anyway, upon his return to the movie-making world, he signed with Columbia Pictures to star in a series of unrelated crime and action-themed B-films (A Dangerous Adventure, When G-Men Step In, etc.) that ran from 1937 to 1939; Columbia also top-lined him in 1938’s The Secret of Treasure Island–Terry’s first movie serial, Columbia’s third, and one of their best. This colorful and action-packed chapterplay pitted Terry (as reporter Larry Kent) and leading lady Gwen Gaze (as treasure-map possessor Toni Morell) against a varied and strange assortment of treasure-hungry menaces, and put them through numerous weird and exciting perils on both the titular island and on the mainland. As the beleaguered but indefatigable Kent, Terry did a solid job of conveying both breezy cheerfulness and tough determination; his athletic background also helped him to put across the serial’s numerous fight scenes; though doubled by stuntmen Dave O’Brien and Yakima Canutt in long shots, he was called on to throw many a punch in close-ups–and invariably made them look convincing. 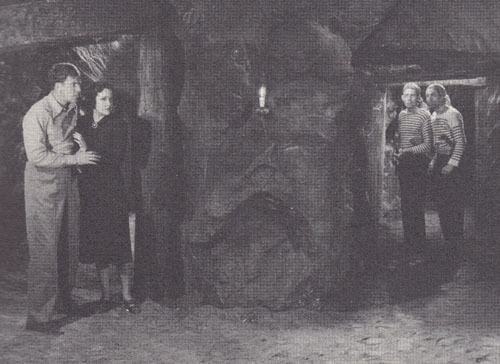 Above: Don Terry and Gwen Gaze (together at left) try to avoid the henchmen of the “Shark” in the tunnels beneath Treasure Island in The Secret of Treasure Island (Columbia, 1938). 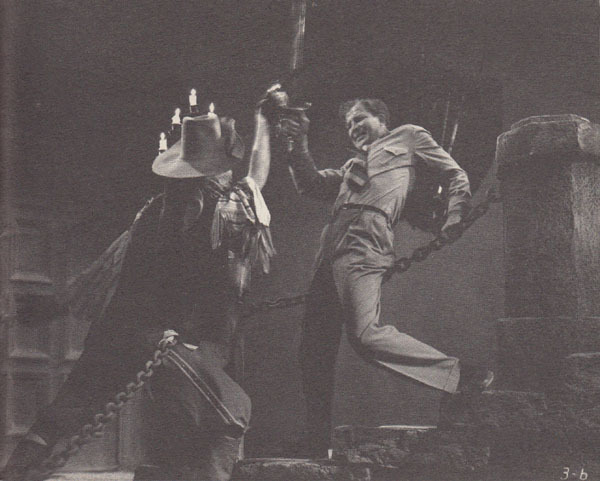 Above: Don Terry battles an apparent pirate ghost in Secret of Treasure Island. 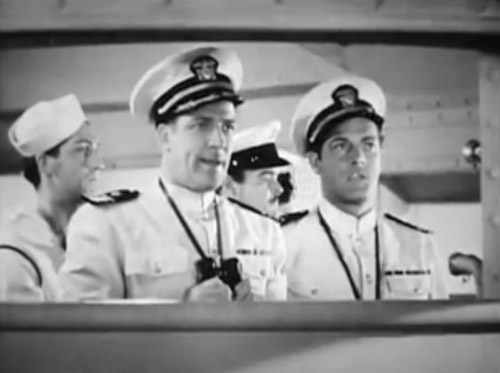 Above: Don Terry issues orders to subordinate officer Dirk Thane; Peter Leeds and John Merton are (respectively) the seaman and the officer in the background. 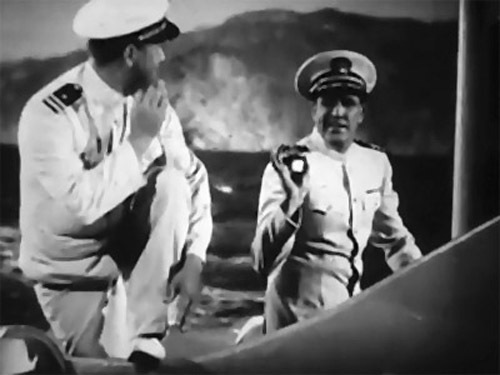 Above: Walter Sande and Don Terry wish each other luck as Terry prepares to ram a Scorpion torpedo boat (after ordering Sande to bail out) in Don Winslow of the Navy. Terry’s next Universal serial was the excellent Western outing Overland Mail (1942), the only one of his chapterplays in which he didn’t play the principal hero. That honor went to Lon Chaney Jr., who Universal was determined to promote in the wake of his success in The Wolf Man; Terry was instead assigned the sidekick role of “Buckskin” Bill Burke, a rough-hewn, roguish, and resourceful frontiersman who helped Chaney’s Jim Lane save a stagecoach line from the ruthless Chadwick (Noah Beery Sr.). Terry played this secondary but prominent part with delightful gusto, whether he was swaggeringly and confidently battling the villains or trading banter with Chaney and co-sidekick Noah Beery Jr.; he probably enjoyed the chance to play a full-fledged character role for a change, and definitely made the most of the opportunity. 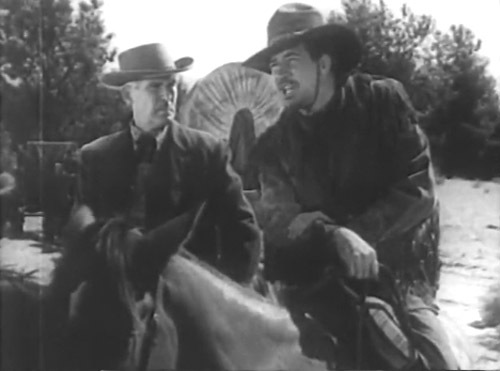 Above: Scouting for a wagon train, Don Terry coolly rejects the bad advice of treacherous wagon boss Harry Cording (off-camera) in Overland Mail (Universal, 1942); Henry Hall is next to Terry. 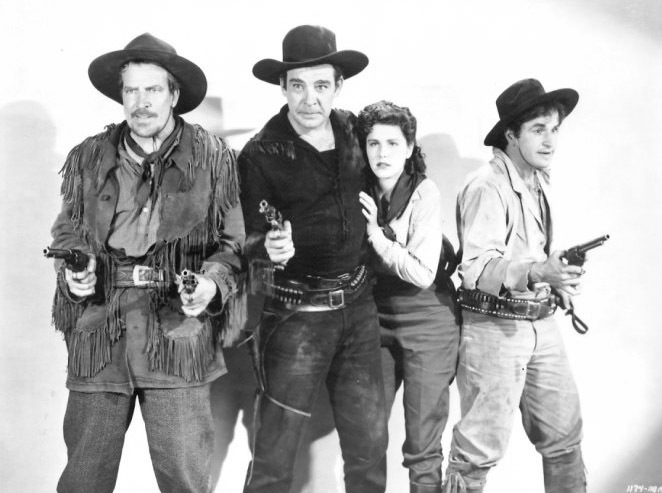 Above, left to right: Don Terry, Lon Chaney Jr., Helen Parrish, and Noah Beery Jr. in a publicity still for Overland Mail. Terry returned to leading-man mode for his final serial, Don Winslow of the Coast Guard (Universal, 1942). This wartime sequel to Terry’s well-received first Winslow outing had Winslow and Pennington (Walter Sande again) temporarily transferred to the Coast Guard in order to keep the Scorpion (now played by Nestor Paiva) and a host of Axis agents from facilitating a Japanese invasion of America’s West Coast. Heaver on action than Navy had been, Coast Guard allowed Terry to emphasize Winslow’s military side more frequently than in the earlier serial; he did a fine job of registering earnest concentration (when planning strategies) and sharp decisiveness (when executing tactics), and also managed some good displays of controlled anger (when reacting to the ruthless treachery of his opponents). 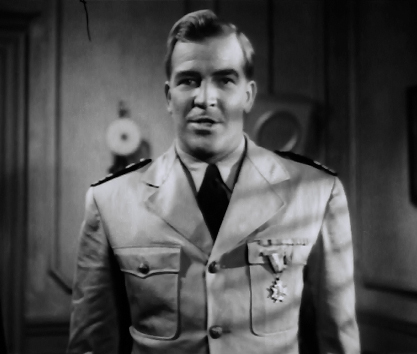 However, Terry still balanced this officerial gravity with cheerfulness, again establishing a strong easygoing rapport with his co-stars (Sande, Elyse Knox as Mercedes, and Edgar Dearing as a salty Coast Guard CPO). Above: “Hit ’em twice as fast..twice as hard…and twice as often.” Don Terry grimly tells Walter Sande that they’ll have to step up their campaign against Japanese submarine raiders in Don Winslow of the Coast Guard (Universal, 1942). Terry only made one more film after Don Winslow of the Coast Guard–the big-budgeted Universal South Seas picture White Savage, in which he played a subordinate heavy. Following this last movie, he permanently abandoned Hollywood and his screen name to follow in Winslow’s footsteps and join the Navy; he finished World War Two as a Lieutenant Commander in the Pacific theater, earning a Purple Heart along the way. After leaving the Navy in 1946, Donald Loker began a new career with the Starkist Tuna company (he had married Katherine Bogdanovich, daughter of Starkist’s owner, in 1941). He spent almost twenty years as Starkist’s public relations vice-president, retiring a millionaire in 1965; he and his wife devoted many of their later years to philanthropy, endowing hospitals, colleges, and research institutes (a quick online search on Donald P. Loker will turn up several institutions that still bear his name). The former Don Terry passed away in the fall of 1988, in Oceanside, California. Donald Loker probably regarded his years as Hollywood’s Don Terry as one of the less important phases of his long and interesting life, but he definitely made a noteworthy contribution to chapterplay history during those years–anchoring the frequently bizarre Secret of Treasure Island with a solid leading performance, nearly stealing the show at times with his excellent character turn in Overland Mail, and twice succeeding in making Commander Don Winslow seem like both a good friend and a first-rate military officer. 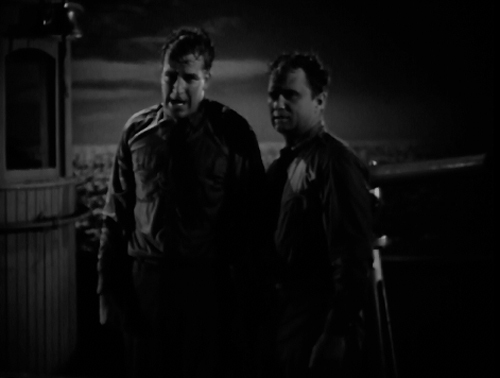 Above: Don Terry turns to address the wartime audience directly, at the end of his last serial, Don Winslow of the Coast Guard (Universal, 1942). Acknowledgments: Most of the above information on Terry’s early life came from this Online PDF of a 1928 issue (Volume VIII, Issue 1, September 21) of the Norwich Guidon, the paper of Terry’s college.